CREA Laboratory: The first ever assessment of CFD for ORC flows! The first ever assessment of CFD for ORC flows! Abstract: The first-ever experimental assessment of a Computational Fluid Dynamics (CFD) software for Non-Ideal Compressible-Fluid Dynamics (NICFD) flows of interest for ORC applications is presented here. Numerical results using the SU2 open-source suite for multi-physics simulation and design-recently extended to deal with complex thermodynamic models of organic fluids-are compared here to experimental results from the Test-Rig for Organic VApours (TROVA) of the Laboratory of Compressible-fluid dynamics for Renewable Energy Applications (CREA), Politecnico di Milano. Experimental results regard supersonic expanding flows of siloxane fluid MDM (Octamethyltrisiloxane, C8H24O2Si3) in non-ideal conditions representative of ORC applications. Three different geometries are considered for the assessment of the CFD solver. The first is a converging-diverging nozzle, representative of ORC supersonic stators, in which the fluid is accelerated to supersonic speed from highly non-ideal conditions, with inlet compressibility factor Z=Pv/(RT), computed using reference Equations Of State (EOS) for MDM fluid, as low as Z=0.81. 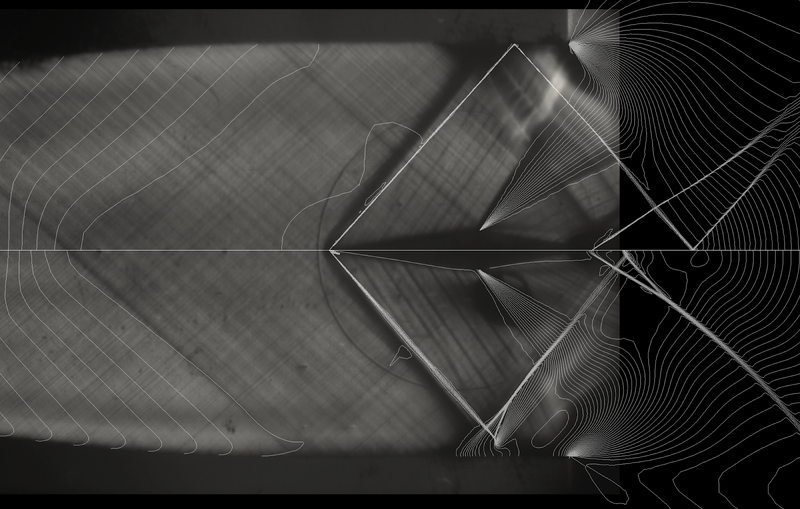 The second geometry is a diamond-shaped airfoil at zero incidence in a supersonic flow at Mach 1.5 and Z=0.88, in mildly non-ideal conditions. 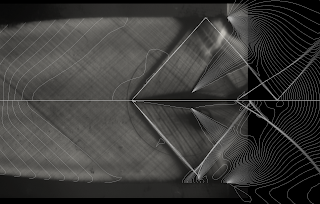 Oblique shock waves are observed at the airfoil leading edge and interact with the wind-tunnel walls and the rarefaction fan from the airfoil. This test case is useful to understand the physics of oblique shock-wall and shock-shock interactions in turbine cascades operating in off-design conditions. The third geometry is a supersonic backward facing step, in which the formation of an oblique shock is observed experimentally at the reattachment point past the step. The Mach number is around 1.1 and the compressibility factor Z ~ 0.89. This geometry is representative of the trailing edge of turbine blades and it is useful to study the formation of fish-tail shock waves. These NICFD flows are fairly well captured by the CFD solver, thus confirming the validity of both the thermodynamic models and of the CFD implementation, using both the Euler equations for inviscid flows with negligible thermal conductivity and the full Reynolds-averaged compressible Navier-Stokes equations for non-ideal compressible turbulent flows. In the considered shocked flows, grid adaptation is found to be key to capture the relevant flow features using a reasonable amount of grid points.